Former Trump lawyer Michael Cohen, who was recently sentenced to three years in prison as a consequence of Robert Mueller's Russia investigation, was scheduled to appear before the House Oversight Committee on Feb. 7. It was a voluntary decision and an opportunity he said he was "looking forward" to. On Wednesday, Cohen requested his testimony be postponed because he's now concerned for his family's safety, particularly the "ongoing threats" from President Trump and his lawyer Rudy Giuliani. Over the past week, both Trump and Giuliani have suggested that Cohen's father-in-law, Fima Shusterman, be investigated for alleged ties to organized crime. Giuliani made the argument in an interview with CNN's Jake Tapper, while Trump brought it up on Twitter. Oversight Chairman Elijah Cummings (D-MD) said Cohen's safety concerns were "legitimate." “Efforts to intimidate witnesses, scare their family members, or prevent them from testifying before Congress are textbook mob tactics that we condemn in the strongest terms,” Cummings and House Intelligence Committee Chair Rep. Adam Schiff (D-CA) wrote in a joint statement. 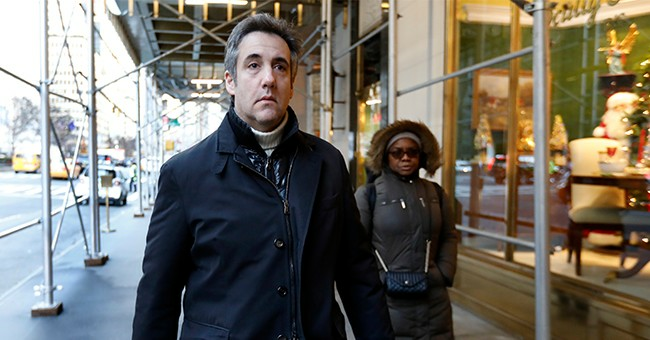 Last month, Cohen to three years in federal prison for several crimes, including campaign finance violations, regarding his hush payments to two women who allegedly had an affair with Trump, and lying to Congress about a Trump Tower project in Moscow. A recent BuzzFeed report suggested that Trump directed his lawyer to lie about the construction project, but Mueller's office refuted the story. During his sentencing hearing, Cohen said he regretted his "blind loyalty" to Trump. No future date has been set yet for Cohen's testimony. It was off limits publicly, but other lawmakers planned to speak with Cohen privately about the Russia investigation.